These are all essential for coordinating the creation of useful questions and answers, but originally comments were not part of the design for this system! During the beta period, it was observed that, without a way to annotate or discuss specific posts, answers became noisy and tangential. Therefore, a separate space was carved out for this purpose below each post, leaving answers free for content that, y'know, actually tries to answer the question. Comments can become obsolete, addressing issues or concerns long ago addressed via edits to the post itself. Those one-liner contests Jeff alluded to don't always produce results as charming and witty as one might like. With the addition of comment replies and real-time notifications, comments can be used for casual conversation and debate - fun and perhaps even enlightening for those involved, noise for those just looking for an answer. The authors of the comments themselves can clean up after they're done, if they so desire. Moderators can remove individual comments or entire comment threads, move comments to chat, and even lock posts if comments are getting unruly. When should I delete my own comment? When should moderators delete comments? When should moderators edit comments? These guidelines are for main Q&A sites (not meta sites). When it will be shown to future readers but offers them nothing of value, or what value it has is overshadowed by the comment being unfriendly or outright rude. This comment attacks a person or group. Learn more in our Code of Conduct. This comment is rude or condescending. Learn more in our Code of Conduct. 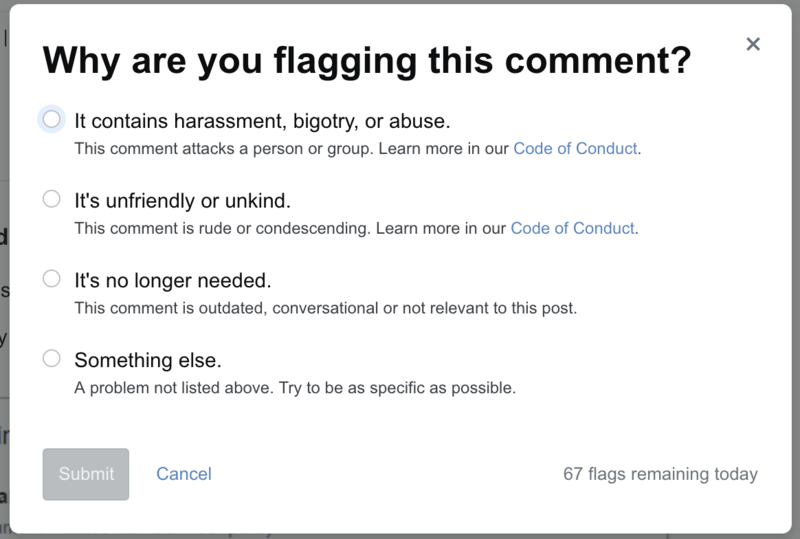 Comments that contain harassment, bigotry or abuse or that are unfriendly or unkind should always be flagged. What you consider rude is subjective, but as a general rule if it is more likely to upset readers than it is to inform them, it qualifies. In deciding between the two flags, consider whether the comment is directly attacking a person (or the content they create) or a group. If so, it's probably appropriate to flag with the first reason. If it contains "pithy" jokes made at the authors' expense or "snarky" advice meant more to score points with the commenter's peers than to inform or educate it's probably a better fit for the second. Obsolete/outdated comments. They served a purpose once upon a time but no longer: requests for clarification that've been addressed via edits, suggestions for improvement that were long ago heeded, etc. Don't worry about these if they're not displayed by default - if most readers don't see them, they're not causing any harm. Chatty comments. They might be polite, friendly, or even informative - but have nothing whatsoever to do with the post! Whether tangential discussions or simply two friends chewing the fat, these are pretty benign - right up until they're being shoved in the face of every reader two years later. Again, don't worry too much about these if you don't see them by default. Jokes, "thank you", etc. - not necessarily harmful in the moment, but distracting and annoying after the fact. Something else covers everything else in a comment or comment thread that might benefit from a moderator stepping in to clean up. Be explicit about the problem that you see - don't assume it'll be obvious to the moderator. If there are only one or two problematic comments on a post, just flag them individually; if most or all of an entire comment thread needs to go, just flag the post itself and suggest that it be purged. Note: don't be too concerned if the occasional comment flag is declined; comment value is often subjective and moderators are encouraged to process flags quickly - in most cases, it's no big deal if comments persist a bit longer than needed. Moderator note: Moderator flags of all types on comments take action immediately, deleting the comment that is flagged - this can serve as a substitute for deletion on overtly abusive or unfriendly comments, as the flags then serve to keep a record of such behavior. Same advice as for flaggers: when they offer no currently applicable constructive requests for improvement to the post. Moderators may generally process comment flags without much deliberation: if it doesn't immediately appear to be needed, remove it; if it might be, leave it. There are almost always more useful things to do than to stress about comments. You may decline if you think the flag is too questionable. Let another mod handle if the subject matter is not familiar to you. If the flagged comments appear to be part of a larger, now obsolete conversation, then remove the entire conversation. If many problematic comments are interspersed with a few allowable ones, purge the lot and then selectively undelete those that suggest improvements. Don't worry about cleaning up benign conversations that don't appear on page load. Do purge old, benign conversations that are in the face of every reader. Prefer to use flag deletion to better document the comment as opposed to non-flag deletion. Simply copying the existing comments to a chat room and leaving a link to it can serve to encourage participants (and others interested in continuing the discussion) to follow. If there's no pressing need to delete existing comments, leave them for context - though you may need to reinforce your encouragement by deleting any subsequent comments. If the conversation has become extremely off-topic or distracting, you may wish to purge the entire set of comments and selectively restore those that remain relevant to the post. When it offers nothing of value to either the author of the post or to future readers. This is particularly important when the comment is shown by default on page load - if readers need not opt-in to reading it, it should offer them something of value. Try to avoid leaving long comment threads "broken" by deleting your comments while leaving replies to them. If a long thread has become irrelevant, coordinate the removal by suggesting deletion to the other participants and giving them time to respond before removing your own comments. If the thread is old and the participants have moved on, flag the post itself for moderator attention and suggest purging - be sure to explain why! To fix typos or other minor errors that the author has written a second comment to correct (at which point the second comment can be deleted). This is usually a waste of time, but can be worthwhile in particularly embarrassing scenarios or with a broken link. -1: I'm downvoting you as hard as I can, because this answer contains an error on line 5: you should never poke bears with a sharp stick just to see if they're still alive. Removing the italicized text may be worthwhile to allow readers to focus on the potentially life-saving advice without sparking a voting war. The onset of frostbite can be subtle; therefore, to this advice I would also add that, when spending the night in harsh conditions, it is important to prepare ahead to protect yourself from the elements. Also, your mom. Again, remove the bit in italics. When editing comments for tone, you should strive to make the smallest edit necessary to correct the problem. You should also generally leave a comment advising the comment's author against such faux pas in the future! Such commentary helps to avoid the appearance of deceit. To fix a comment that you just converted from an answer. Sometimes, converting an answer to a comment destroys the formatting or cuts off parts of the post. You can and should fix those issues, but make sure to keep the post’s content intact. Not the answer you're looking for? Browse other questions tagged discussion comments flags comment-flags moderator-faq . What can I do if some moderators delete my comments improperly? Is it wise or just sugar-coating to remove the comments? Does the 'not constructive' flag have a strongly negative connotation? If so, can we have more detailed clarity on its use? Is proper attribution given when a moderator edits someone's comment?